The Sun is finally acting like it’s in solar maximum. Our Sun has emitted dozens of solar flares in since Oct. 23, 2013, with at least six big X-class flares. Just today it blasted out a X1.1 flare at 04:32 UT (11:32 p.m. EST on Nov. 7, 2013). While old Sol had been fairly quiet for the time where it was supposed to be active in its normal 11-year cycle, only recently has activity ramped up with increased flares and sunspots. During 2013, there has been intermittent strong activity (like this and this in May), but the activity since mid-October is really the first extended period of activity. Speaking of sunspots, a huge group called designated as AR 1890 has turned to face Earth. Thanks to astrophotographer Ron Cottrell for capturing the group today, above. Spaceweather.com reports that this sunspot has a trend of producing very brief flares. The X1-flare today was no exception as it lasted barely a minute. NOAA is forecasting a 60% chance of M-class solar flares and a 20% chance of X-flares on Nov. 8th from this sunspot group. 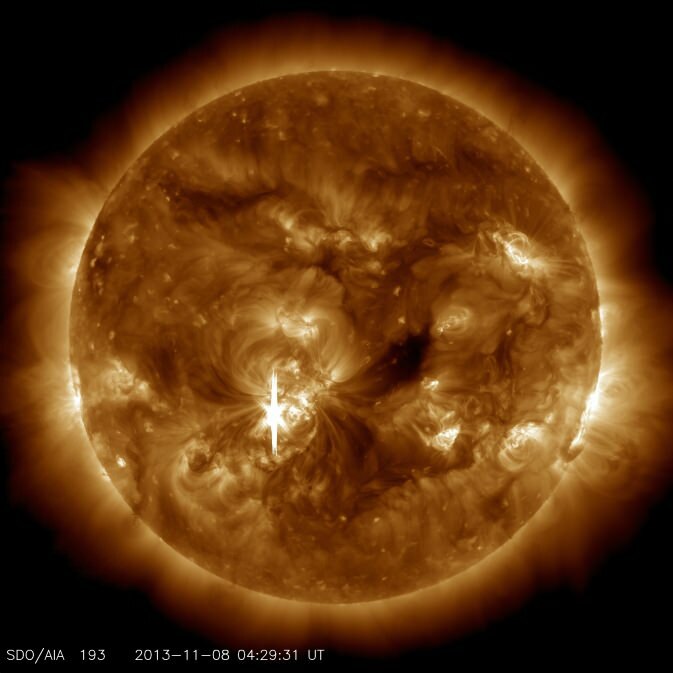 NASA’s Solar Dynamics Observatory captured this image of the sun showing an X1.1 class flare that peaked at 11:26 p.m. EST on Nov. 7, 2013. Increased numbers of flares are quite common at the moment as the sun’s normal 11-year activity cycle is ramping up toward solar maximum conditions. While solar flares are powerful bursts of radiation, harmful radiation from a flare cannot pass through Earth’s atmosphere to physically affect humans on the ground. But when they are intense enough, they can disturb the atmosphere in the layer where GPS and communications signals travel. You can keep track of the Sun’s activity at NOAA’s Space Weather Prediction Center and the Solar Dynamics Observatory website. Sun is preparing for a nap, or a 90,000 year Ice Age hibernation ?